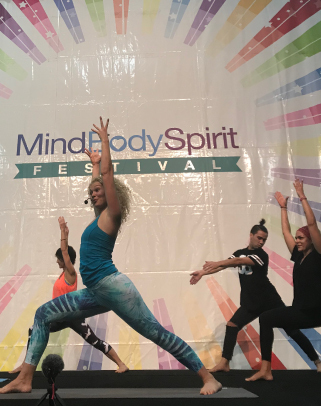 Live music, movement & dance, guided yoga, celebrity psychics and fitness demonstrations. The Main Stage offers visitors high energy musical or movement performances alongside interactive psychics. Presentations are 60 minutes in length (inclusive of set-up and pack down). All AV is provided: PA system including up to 4 standard microphones, one headset, one line in Di and one option to play iPod or CD. Please bring your own iPod / CD / USB if you would like to play specific background music. The Main Stage has the capacity of up to 100 visitors seated plus standing room and is located within the festival floor. Please note; The stage is set up with lecture style seating. If you are planning to do an activity class, it will need to be a seated/standing series. Healthy, raw cooking demonstrations, nourishing advice and expert dietary tips. 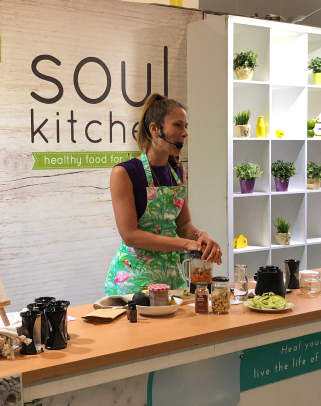 The soul kitchen is an interactive nutritional demonstration stage dedicated to the best in healthy food, recipes and nutritional advice. Soul Kitchen demonstrations are 60 minutes in length inclusive of set-up and pack down. Audio (PA system including lapel and standard microphone options, no operator) cooking bench and power are provided, however, presenters must supply their own appliances for demonstration (flames/heat will require approval in advance). The Soul Kitchen seats between 50 – 60 visitors, and is located within the festival floor. Please ensure you have a valid Food Handling Certificate. 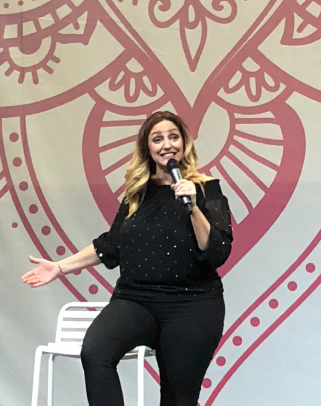 Wellness and spiritual demonstrations and talks from industry experts. The Speakers Lounge seats 40 – 50 visitors within the Festival floor allowing visitors walking past the opportunity to stop and listen. 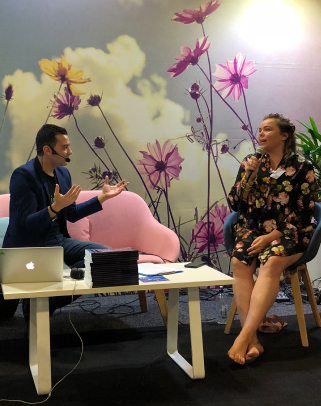 A Speakers Lounge presentation is 45 minutes in length and you are provided with adequate seating, presentation table, a whiteboard, projector and screen. AV is provided (PA system with standard microphone or headset), however, please make sure you bring your own laptop if you’re teaming your talk with a PowerPoint presentation. Spiritual & health guidance, empowerment and life coaching seminars from industry experts. The Seminar Room space offers a private theatre style seating of 40 – 50 visitors in an isolated room (away from the Festival floor). A Seminar Room session is 45 minutes in length and you are provided with adequate seating, presentation table, whiteboard, projector and screen. AV is also provided; a PA system with a standard microphone or headset, however, please make sure you bring your own laptop if you’re teaming your talk with a PowerPoint presentation. 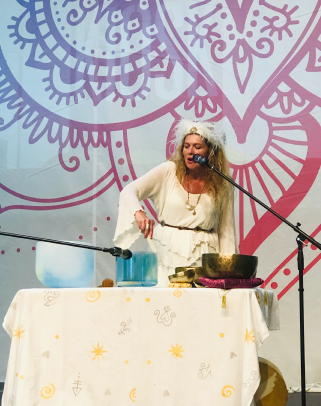 Guided active movement classes, intimate sound healing, interactive lessons and activities. The workshop space provides an intimate environment where visitors can experience a hands-on interactive class. 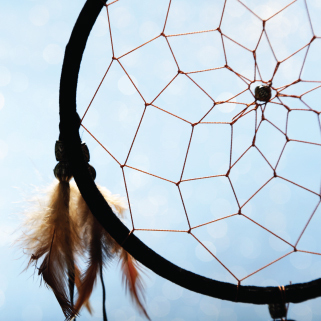 For example; Yoga, sound healing, journal writing workshop, Qi Gong and much more! Workshops run for 60 minutes and are designed to be interactive allowing visitors to get involved. This is not the place for a seminar-style presentation. You are provided with Audio (PA system with standard microphone or headset) adequate seating, presentation table, a whiteboard and a projector screen. Please make sure you bring your own laptop if you’re teaming your talk with a PowerPoint presentation. The workshop space has a seating capacity of approx. 50 – 60 people.